We hear a lot about income equality in the U.S., but very little about the actual root cause of wealth redistribution – government monetary policy. Through quantitative easing – essentially money printing – the Fed enriches bankers and the political elite while stealing wealth from everyday Americans via currency debasement. 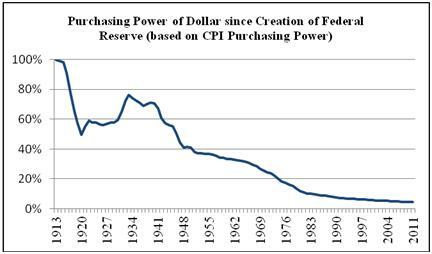 Since the creation of the Federal Reserve in 1913, the purchasing power of $1 has dropped to less than 5 cents, a nearly 96 percent decrease. Ron Paul brought attention to the Federal Reserve and its lack of accountability, sparking a movement to “End the Fed.” But Congress has predictably failed to act. In fact, it can’t even manage to pass a bill to audit the central bank. The federal government never reins in its own power – and the existence of a central bank represents just that. The Fed facilitates economic central planning and enables the government’s reckless spending. It will never end as long as we count on D.C. politicians to get the job done. But we can take actions on the state level, and even as individuals, to end the Federal Reserve’s monopoly on money. Currently all debts and taxes in states around the country are either paid with Federal Reserve notes (dollars), authorized as legal tender by Congress, or with coins issued by the U.S. Treasury — almost none of which contain gold or silver. But two states have taken steps toward a return to constitutional tender with the passage of Constitutional Tender Acts. Passage of SB862 in Oklahoma in 2014 made it law that “Gold and silver coins issued by the United States government are legal tender in the State of Oklahoma.” Putting this legislation into practical effect would introduce currency competition with Federal Reserve notes. The Utah legislature took similar steps in 2012. 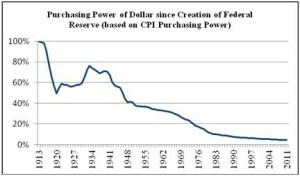 In his Mises Institute paper, Ending the Federal Reserve From the Bottom Up: Re-introducing Competitive Currency by State Adherence to Article I, Section 10, Professor William Greene argues that if enough states start transacting business in sound money, it would effectively nullify the Federal Reserve and end the federal government’s monopoly on money. The creation of the Texas gold depository this year also creates a pathway to undermine the Federal Reserve. Under the new law, private individuals and entities will be able to purchase goods and services using sound money, backed by gold or silver stored in the state depository, bypassing the dollar and the U.S. central bank completely. If duplicated in other states, constitutional tender acts and state precious metal depositories have the potential to break the federal government money monopoly and in effect, nullify the Fed. But we don’t have to wait for the government to take action. We can bypass the Federal Reserve and conduct business using real money with real value by bartering with gold or silver. For example, I traded the audio right to my book Our Last Hope: Rediscovering the Lost Path to Liberty for silver. Peter Schiff has developed all of the tools you need to get started doing business with physical gold or silver. Check out his Barter Metals page HERE. Instead of trying to pass laws dictating pay scales or creating tax schemes to redistribute wealth, anybody who cares about true economic justice should seek to break the government’s monopoly on money and the economy, and allow a true free market to flourish. Many thanks for this, I’m going to undoubtedly discuss the idea with my readership.